Monthly food drives and milk money collections for local food pantries. Monthly meal prepared and served at the Norwalk Emergency Shelter Manna House in South Norwalk. Parishioner-to-Parishioner Services Directory: In 2010 the Social Concerns Committee compiled a directory of those in the parish who work in the trades and other services. Please consult this Parishioner-to-Parishioner Services Directory if you have need of household or other related services. During the year there are special appeals, such as a new or “gently used” book collection for Christian Community Action children and school supplies collection for the Carver Center children, used cell phones for the Domestic Violence Crisis Center, maternity tops for Birthright of Norwalk Mothers-To-Be, gift packs for Walter Reed veterans, an Earth Day program, Homefront Day-house fix-ups for needy Norwalkers, a coat collection for The Mayor’s Coat Drive, an Emergency Preparedness information distribution, Make-A-Difference Day food collection, and community garden plots to grow vegetables for CCA Food pantry. If you know a parishioner who could use some extra support, please get in touch with the Social Concerns Committee contact person. The Social Concerns Committee can arrange rides to appointments, supply a needed meal, and help with shopping and household tasks. Our monthly food drives have been a source of food for over 30 years for the South Norwalk food pantry at 76 Main Street which formerly was affiliated with the Christian Community Action group and now is operated by Person-to-Person(P2P). (Click here to seethe food pantry’s thank-you letter to the parish.) For the last several years, we have averaged an annual collection of 15,500 food items – 3,500 from our Special Lenten Food Drive; 2,000 from the combined parish and REACH Thanksgiving Food Drives; and 1,000 food items each month from food drives the remaining 10 months. Because of this overwhelming generosity from the parishioners, in addition to donating to the P2P food pantry we also give 100 food items each month to Mid-Fairfield Aids Project (MFAP) at 16 River Street in Norwalk, 500 food items from both our Special Lenten Food Drive and our Thanksgiving Food Drive to St. Vincent de Paul Society’s Food Pantry at 203 East Avenue in Norwalk, and the food items collected from the 6:00 PM Life Teen Mass each month to the Norwalk Emergency Shelter at 4 Merritt Street in Norwalk. Our REACH religious education students are faithful contributors to the food drives held from September through May. Each month one class in grades 4-6 stays after the REACH 10:30 AM Mass Sunday morning in the church hall to help unpack, sort the food items by type, and bag them. The sight of the children emptying donation bags and piling up stacks of soup cans, cereal boxes, peanut butter, and the like, genuinely reveals the meaning of “many hands make light work.” When the sorting is finished, the food is loaded into the cars of the committed volunteers who deliver it to the pantries the next day. St. Jerome’s monthly Milk Fund Collection, a cash offering that purchases milk for local food pantries, was started in January, 2002. For the last several years, we have collected $3,300 each year. These funds provide powdered milk to P2P’s food pantry, and whole milk to the St. Vincent de Paul Society’s Food Pantry and to the Norwalk Emergency Shelter. In addition to their extremely generous response to our monthly food drives and milk fund collections throughout the year, St. Jerome parishioners overwhelmingly have given to our Special Lenten Food Drive, initiated in 2005. Parishioners are invited to provide up to one week’s worth of food for one hungry person who receives food from a local food pantry. A flier with a shopping list of specific items allows parishioners to “shop the list” and donate as many items as possible. 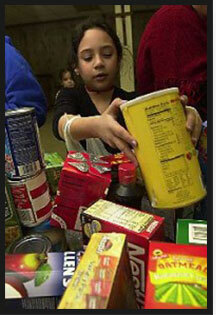 In 2005 some 3,000 food items weighing almost 1.5 tons were collected. In 2006 over 40% more was collected: 4,350 food items weighing 2.2 tons! The Norwalk newspaper, The Hour, featured a front page story about the parish’s outpouring of generosity. A letter to the Editor in the diocesan weekly, The Fairfield County Catholic, described it as the “Food Drive of the Century.” In 2007 a page three article in the Norwalk Hour reported how over 300 parishioners donated another two tons of food to the special Lenten Food Drive. Each of our annual Special Lenten Food Drives has collected an average of 3,500 food items! In 2009 record-breaking numbers of people are coming to Norwalk’s food pantries seeking the most basic need – food. In 2008 the four food pantries to which we donate served over 1.2 million meals, a staggering increase from previous years. Thankfully, the parishioners of St. Jerome’s do what Jesus taught us: feed the hungry. 3To make a contribution, send to Education & Hope, P.O. Box 486, Norwalk, CT 06856, or email us at guatemalahope@optonline.net. Please see the flier for Education & Hope for what your donations can mean for the children. Detailed information about what Education & Hope does can be found here and photos of the children helped can be seen here. Julie’s ardent message of hope comes out brilliantly in a December letter she wrote to the parish to thank them for their support and can be read here. Julie’s work can be seen in several videos available on YouTube at Education and Hope -YouTube. You will enjoy seeing several excellent videos about the Guatemalan children Julie helps, especially the video about Erik. Occasionally Education and Hope is able to make a much more substantial impact. One video, Casa Diega, is the story of a home built by Education and Hope for a grandmother and the eight children in her care. Donors made it possible to provide her family with a decent home so they might live with dignity. The St. Jerome Christmas Giving Tree is a source of help for children in need in Norwalk. Throughout the Advent season, parishioners select a ‘gift wish tag’ from our tree. The ‘wish gift’ is purchased, returned unwrapped and placed under the tree. Items requested include clothing, toys, and books. Each December this annual tradition results in generous donations given to over 75 children from over 40 Christian Community Action families and to nearly 100 children in Julie Coyne’s Education and Hope project in Guatemala. Late 2010 St. Jerome’s joined CONECT, a non-partisan, multi-faith organization of 15,000 people from 25 congregations – Catholic, Jewish, Protestant, and Muslim – from Norwalk to East Haven CT, who join together 5to effect change in the areas of social and economic justice and policies for the common good. We discover, research, analyze, and articulate a powerful moral voice to negotiate with business and government leaders regarding social, economic, and political issues that affect our member congregations. Issues include obtaining public hearings for health care insurance rate increase requests, disaster relief for those who have lost their homes, job training for real jobs, and driver’s licenses, car registration, and car insurance for the immigrant community. Fr. David, who has been very active in the CONECT Safe Driving Campaign to obtain drivers’ licenses for undocumented immigrants, explained both the theological and the good common sense reasons for the campaign in a parish weekly bulletin insert of his “Random Thoughts” column. 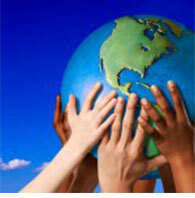 What can we as Christian caretakers of our earth and caregivers of the poor do to affect our environment positively? Concrete tips and vital information about “going green” are provided in a special newsletter sponsored by the Social Concerns Committee. Appearing periodically as an insert in the church bulletin, the “Going Green” Newsletter conveys ideas on how we can actively adapt our behaviors to protect the environment God gave us. Learn how to reuse, recycle, and reduce consumption in simple, friendly, doable ways. With every activity of our daily lives, we connect with the interdependent web of life on earth. The health of our environment is a reflection of the choices we make. Change must begin with us. Change begins with awareness of how the way we act affects the world community, especially the poor and those in need who are most at risk due to climate changes brought on by our use of the world’s resources. St. Jerome volunteers prepare and serve the noon meal at Manna House, 4 Merritt Street, Norwalk, on the fourth Wednesday of every month. Tasks include preparing the main meal (main dish, salad, beverages, and desserts), setting the tables, and clean-up. The kitchen staff reports at 10:30 AM. Servers may arrive at noon. Mealtime is 1:00 to 2:00 PM. Anyone is welcome to join us. Household items: large pots for cooking, knives, forks, spoons, glasses, plates, baking pans, and the like. Monthly meetings provide love and support through service and sharing. Volunteers serve a full luncheon in the parish hall after a funeral service. They provide a full meal, help cook, and set up and clean up.. Since February 2008 several women of the parish in St. Jerome’s Prayer Shawl Ministry have been meeting twice a month to knit and crochet shawls for the sick and homebound. Father Joe blesses these shawls, a prayer card is enclosed with each shawl, and he distributes them on his visits to the sick. The group also has donated 20 shawls to the Whittingham Cancer Center at Norwalk Hospital. Over 60 St. Jerome parishioners have received shawls and the recipients remark that they feel much comfort when wrapped in the shawl. In mid-February 2009 some of the shawls were displayed on the altar steps for all the parishioners to see. To encourage parishioner-to-parishioner contacts for needed services and to support skilled workers in the parish, a directory has been compiled of those in the parish who work in services such as: electrical work, home improvement, interior/exterior painting, tree removal, computer repair, tailoring, tutoring, counseling, candidate placement, real estate, and other services. Please click here to see this directory. Started under the sponsorship of the Pastoral Council, the St. Jerome Americares Homefront Day took place annually from 2006 to 2009 on a Saturday in early May. Americares Homefront is a volunteer home repair program that provides repairs at no cost to homeowners in need. Some 20-30 parishioners of all ages took part annually in providing needed repairs on a house in Norwalk – minor carpentry, work on doors and windows, painting inside and out, general house and yard cleanup, flooring, plumbing, and whatever was needed to help a local neighbor in need. The 2009 St. Jerome Homefront Day made front page news in the local newspaper (click here for story). In 2010 St. Jerome conducted its own Makeover Day and provided needed repairs to the home of a parishioner. The program was then discontinued.